and her name was Elizabeth. and ordinances of the Lord blamelessly. and both were advanced in years. to enter the sanctuary of the Lord to burn incense. standing at the right of the altar of incense. Zechariah was troubled by what he saw, and fear came upon him. because your prayer has been heard. and you shall name him John. for he will be great in the sight of the Lord. He will drink neither wine nor strong drink. “How shall I know this? “I am Gabriel, who stand before God. I was sent to speak to you and to announce to you this good news. and were amazed that he stayed so long in the sanctuary. and they realized that he had seen a vision in the sanctuary. Then, when his days of ministry were completed, he went home. 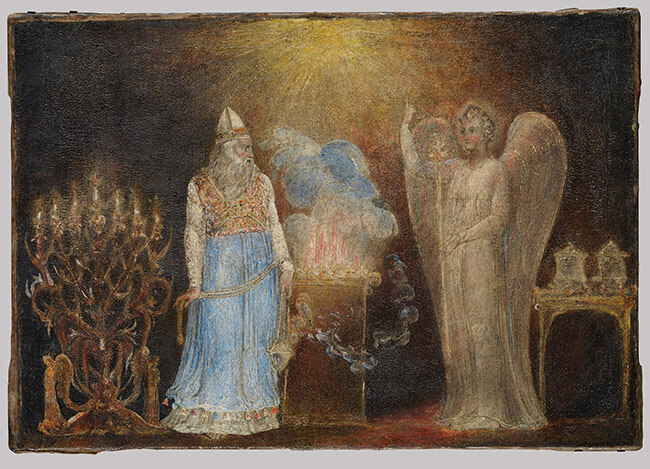 Blake illustrates these verses from Luke (1:5–13) that describe Gabriel’s announcement. The priest’s fear and astonishment in the face of the heavenly apparition are vividly described, as are the details of his colorful costume and the furniture of the Temple. Clouds of bubbles from the burner Zacharias holds join the smoke and flames from the fire on the altar of incense. The picture belonged to an important commission. 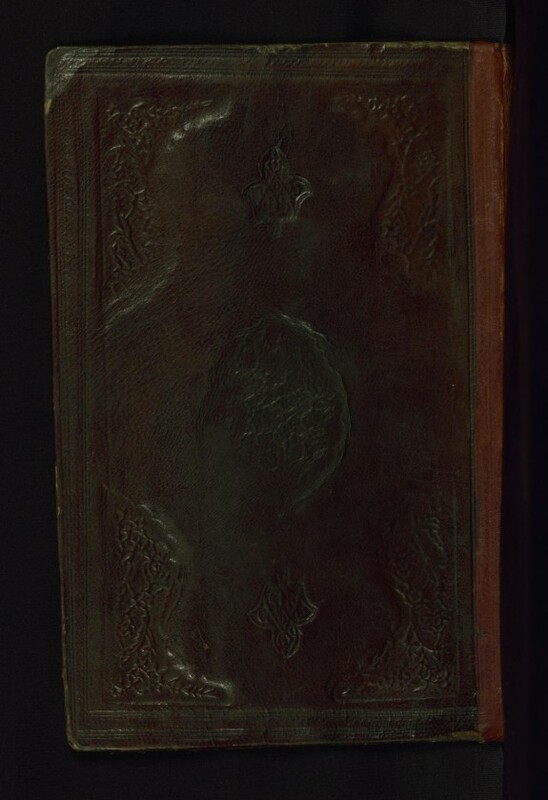 It is one of fifty Old and New Testament subjects ordered from the artist in 1799 by his principal patron, Thomas Butts, a clerk in the war office. For more on William Blake, read this. The exhibition James Tissot: “The Life of Christ” includes 124 watercolors selected from a set of 350 that depict detailed scenes from the New Testament, from before the birth of Jesus through the Resurrection, in a chronological narrative. It marks the first time in more than twenty years that any of the Tissot watercolors, a pivotal acquisition that entered the collection in 1900, have been on view at the Brooklyn Museum. Born in France, James Tissot (1836−1902) enjoyed great success as a society painter in Paris and London in the 1870s and 1880s. While visiting the Church of St. Sulpice, he experienced a religious vision, after which he abandoned his former subjects and embarked on an ambitious project to illustrate the New Testament. In preparation for the work, he made expeditions to the Middle East to record the landscape, architecture, costumes, and customs of the Holy Land and its people, which he recorded in photographs, notes, and sketches. 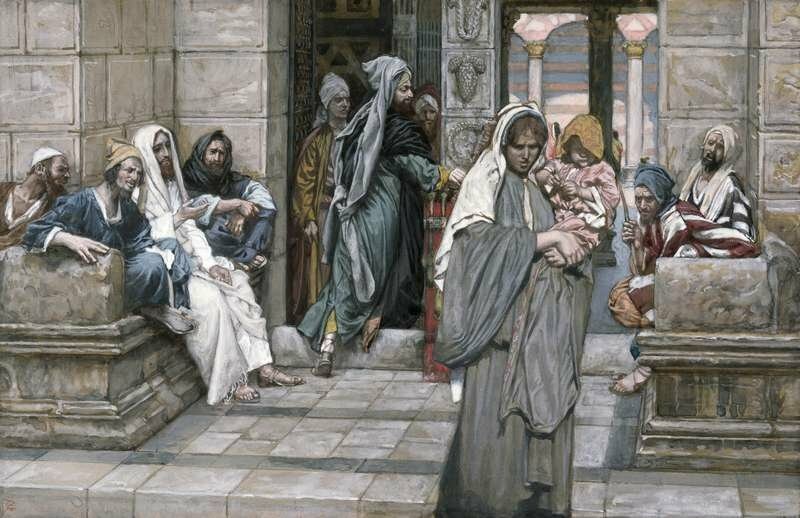 Unlike earlier artists, who had often depicted biblical figures anachronistically, Tissot painted his many figures in costumes he believed to be historically authentic, carrying out his series with considerable archaeological exactitude. First presented in Paris in 1894, the watercolors were received with great enthusiasm, and a highly publicized exhibition later traveled to London and the United States, visiting Manhattan, Brooklyn, Boston, Philadelphia, and Chicago. In 1900, at the suggestion of John Singer Sargent, the Museum decided to acquire the series; the purchase funds were raised primarily by public subscription, spurred on, in part, by exhortations in theBrooklyn Daily Eagle newspaper urging readers to contribute to the campaign. 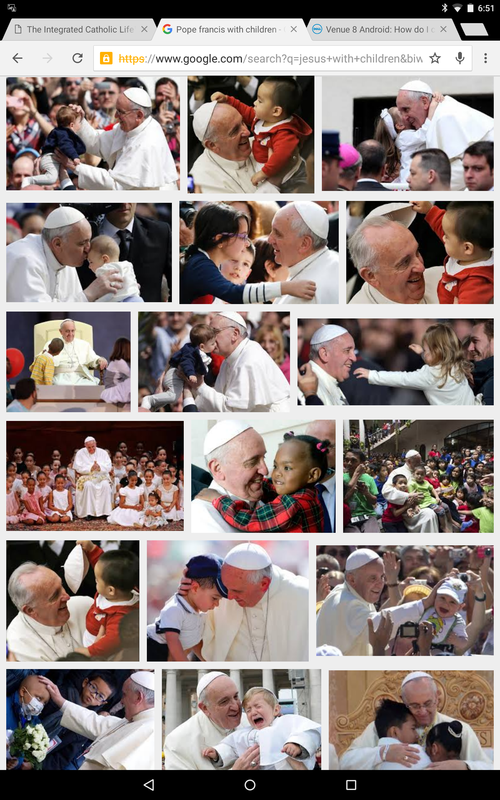 For more on this collection, click here. and the last condition of that man is worse than the first. What is the point of Jesus’ grim story about a vacant house being occupied by an evil force? It is not enough to banish evil thoughts and habits from our lives. We must also fill the void with God who is the source of all that is good, wholesome, true, and life-giving for us. 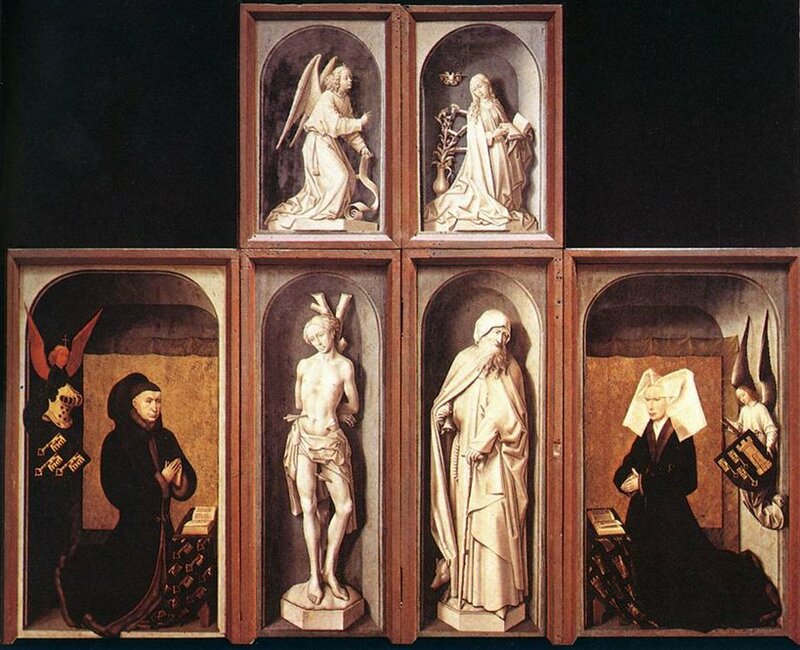 Augustine of Hippo said that our lives have a God-shaped void which only God can fill satisfactorily. If we attempt to leave it vacant or to fill it with something else, we will end up being in a worse state in the end. What do you fill the void in your life with? The Lord Jesus wants to fill our hearts and minds with the power of his life-giving word and healing love. Jesus makes it very clear that there are no neutral parties in this world. We are either for Jesus or against him, for the kingdom of God or against it. 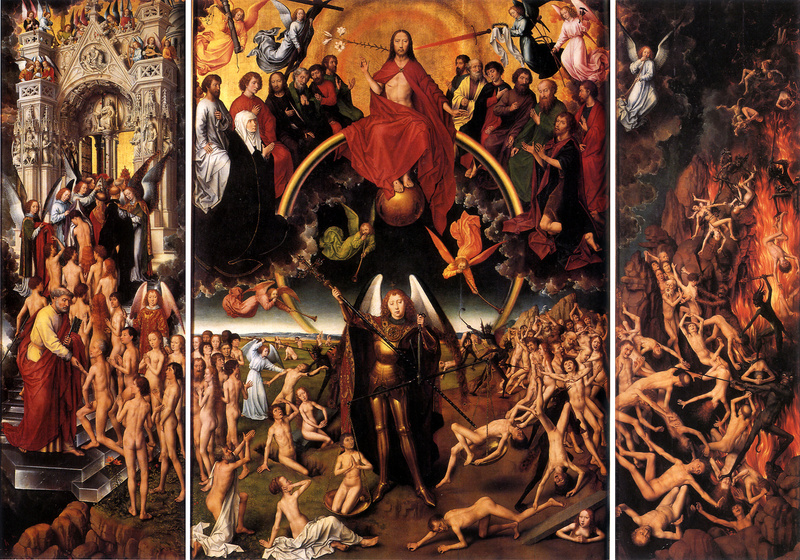 There are ultimately only two kingdoms which stand in opposition to one another – the kingdom of God and the kingdom of darkness which is under the rule of Satan. If we disobey God’s word, we open to door to the power of sin and Satan. Is Jesus the Lord of your mind, heart, and home? If we want to live in true freedom, then our “house” (the inner core of our true being) must be occupied by Jesus where he is enthroned as Lord and Savior. The Lord assures us of his protection from spiritual harm and he gives us the help and strength we need to resist the devil and his lies (James 4:7). “Because you have made the Lord your refuge, the Most High your habitation, no evil shall befall you, no scourge come near your tent. For he will give his angels charge of you to guard you in all your ways”(Psalm 91:9-11). Do you know the peace and security of a life submitted to God and his word? 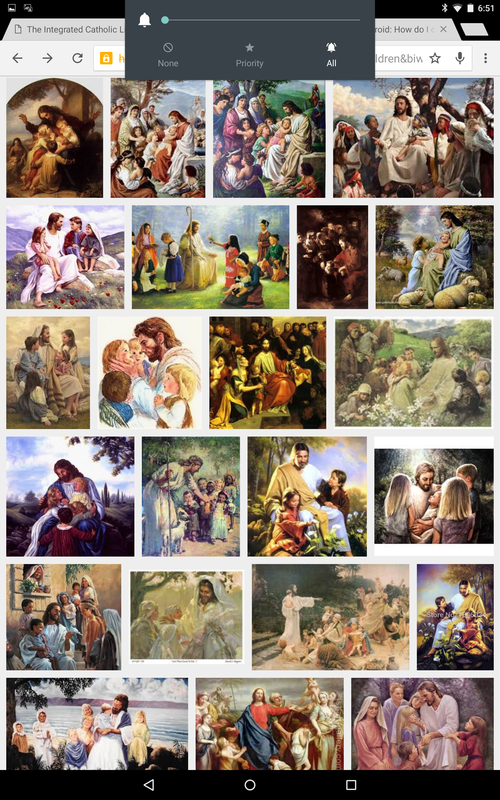 If you Google “Jesus with children”, the image results are mostly sappy, poor quality illustrations that cannot be called art. and there was a man there whose right hand was withered. so that they might discover a reason to accuse him. And he rose and stood there. He did so and his hand was restored. and discussed together what they might do to Jesus. 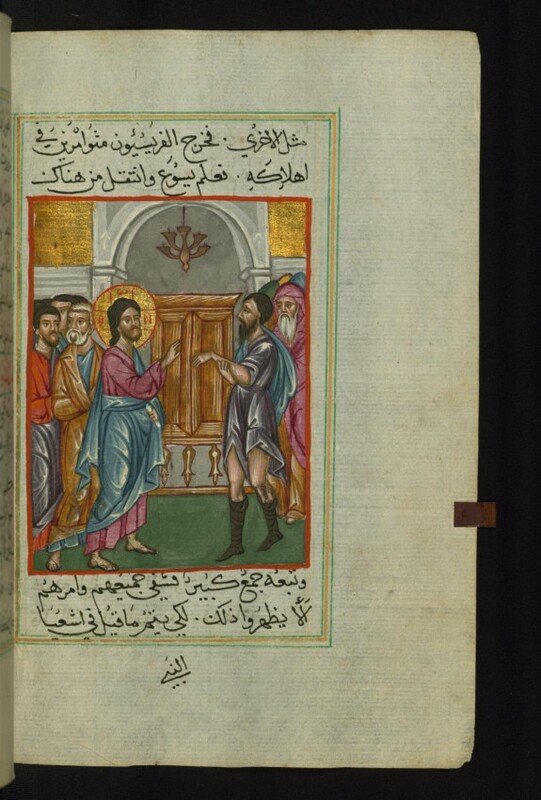 Please visit the Walters Museum page for more illustrations from this gospel manuscript. The healing of the deaf and dumb man (not the blind man as has sometimes been suggested) refers to the story in St. Mark’s Gospel, but here it is situated in a wider context and set against a background of ancient Roman ruins-references that were “de rigueur” for art lovers of the time. Attracted by the supernatural scene, a group of people has gathered before the ancient ruins. 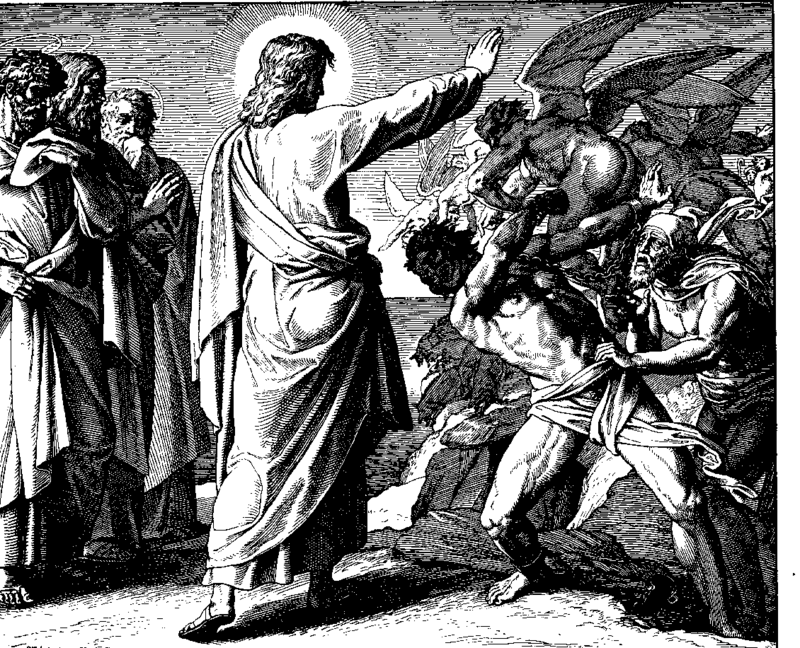 Jesus is performing one of his miracles, probably the healing of the deaf and dumb man. Bartholomeus Breenbergh (1599-1657) depicts the scene at the very moment of the miracle, as recounted in St. Mark’s Gospel: “They brought to him a man who was deaf and had an impediment in his speech, with the request that he would lay his hand on him. He took the man aside, away from the crowd, put his fingers into his ears, spat, and touched his tongue. Then, looking up to heaven, he sighed, and said to him, ‘Ephphatha,’ which means ‘Be opened.’ With that his ears were opened, and at the same time the impediment was removed and he spoke plainly” (7:32-35). Like many contemporary artists, Breenbergh went to Italy, and particularly to Rome, the city where classical antiquity was best represented. He brought back numerous drawings, which would form a range of backgrounds for most of his works. In this picture, the distant ruins overrun with vegetation combine various motifs derived from his Italian studies. The collection of buildings is a slightly modified reprise of the ruins of the Villa of Maecenas at Tivoli, which he had drawn in 1627, while the detail of the coffered vault seen under the main archway is thought to have been inspired by the Basilica of Constantine, one of the most important monuments in the Roman Forum. 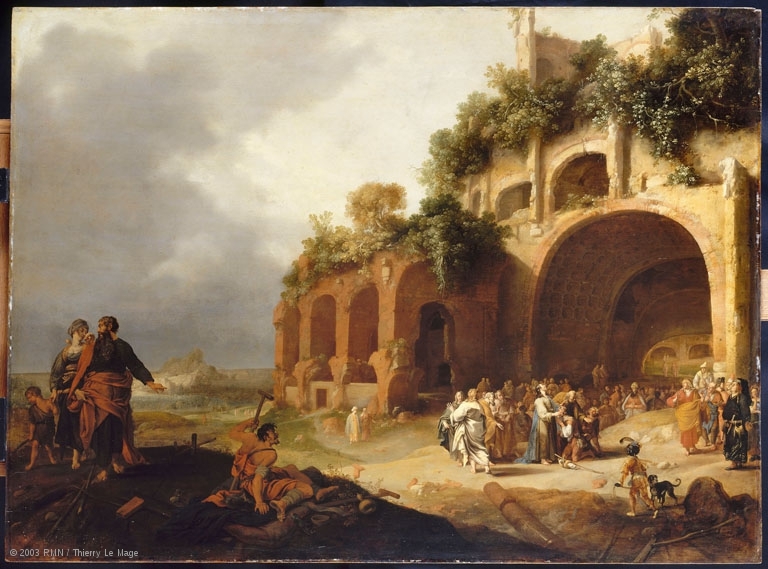 Breenbergh has thus set this scene from Christian antiquity against a picturesque background which accords very well with the taste for things Italian of his own day. Although the principal scene is smaller in scale than the family and beggar in the foreground, Breenbergh guides the gaze of the onlooker by the interplay of light. The alternation of light and dark areas hollows out the space and gives prominence to the healing of the deaf and dumb man by literally putting him under the spotlight. The bright gap in the stormy sky, which explains these various effects of light, is rendered with great sensitivity to atmosphere. In his previous compositions, Breenbergh had displayed a marked preference for landscape over figure painting, characterized by a pre-classical style close to that of Paul Bril (1554-1626). But here there is a fullness to the figures, and exotic touches (the little page with a feather in his headdress walking a dog) are combined with great expressiveness (the very Mannerist, contorted attitude of the beggar on crutches). This renewed taste for pictorial narrative was part of a general movement in Dutch art toward painting historical scenes, also evident in the work of Pieter Lastman (1583-1633) and Rembrandt (1606-1669). – Le Siècle de Rembrandt : tableaux hollandais des collections publiques françaises, catalogue d’exposition, Musée du Petit-Palais, Édition de la Réunion des musées nationaux, Paris, 1970, p. 29.